The worst kept secret in metal is finally out of the bag – and it’s one which already has split the metal community right down the middle: Parkway Drive have been confirmed as the final headliners at this year’s Bloodstock Festival. The Australian metalcore mob, who are currently touring Europe with Killswitch Engage and Thy Art Is Murder, will top the main stage bill on the Saturday (10 August). They join Sabaton, who headline the Friday night, and Scorpions, who undertake the honours on the Sunday. 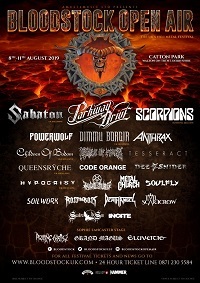 Tickets for Bloodstock, which takes place at Catton Park in south Derbyshire over the weekend of 8 – 11 August, are available HERE.